Coenzyme Q10, also known as ubiquinone or CoQ10, is a vitamin-like substance found in the bodies of almost all life forms. CoQ10 is found primarily within mitochondria, the power plants of the cell, where it is a vital part of the energy producing process and also acts as a free radical neutralizing antioxidant. Natural production of CoQ10 decreases with age and also in certain health conditions. When CoQ10 levels diminish, we tend to see poorly functioning mitochondria and increased free radical damage which is now known to be a cause or consequence of a whole host of diseases. Since we know that CoQ10 levels decline in aging and poor health, why don’t we try and increase them? Actually we have been trying, it just hasn’t worked particularly well. CoQ10 supplements have been widely available for many years, however, the research has shown us that supplementing with standard CoQ10 just isn’t as effective as we’d hope. Although some benefits have been noted in clinical studies, the overwhelming body of evidence is just not particularly strong for many of the conditions it is claimed to help. This is mainly down to one important factor. CoQ10 is a fairly large fat-soluble molecule which ideally needs to be taken with food. This means that absorption from the intestine is relatively poor and slow. As a result, much of it does not make it effectively into the blood stream. 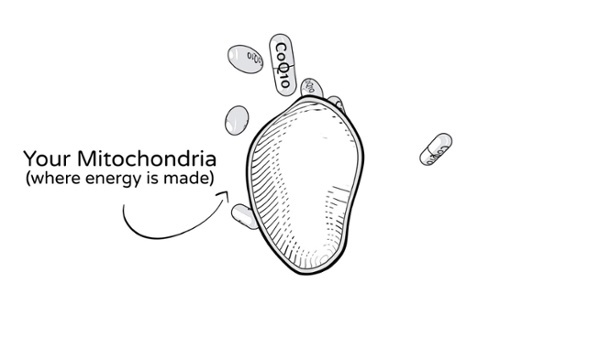 However, some of the CoQ10 that is absorbed does make it inside cells, but only a very small amount of that actually makes it inside our mitochondria. This is because mitochondria make their own CoQ10 and also have very impermeable membranes, allowing only very few molecules to enter from the outside. Several attempts have been made to increase the absorption of CoQ10 with limited success; the most notable of these being “ubiquinol”. Ubiquinol is the “reduced” form of CoQ10, meaning that one end of the molecule has a slight charge. In theory, this could potentially make it more soluble in water and therefore better absorbed by the gut. However, CoQ10 readily transforms between the ubiquinone and ubiquinol forms inside the body, which is the mechanism which allows it to be part of the energy transfer process and to neutralize charged free radicals. When we consume ubiquinol, it is quickly oxidized back into ubiquinone, both in the gut and inside our cells. Despite the impressive marketing claims for ubiquinol, only minor increases in absorption have been noted, and once it is consumed it acts just like standard CoQ10. Other attempts at increasing absorption using novel formulations have also only met with small and limited improvements. The real breakthrough was discovered by two New Zealand biochemists in the late 1990s. They realized that because mitochondria have a significant negative charge compared to the rest of the cell, attaching the right positively-charged molecule to CoQ10 should finally solve the absorption problem. After years of experimenting with different molecules, they found the optimal formulation and 'MitoQ' was born. This mitochondria-targeting of CoQ10 worked amazingly well, with almost all of the MitoQ molecules finding their way into the mitochondria. It is so effective that the dose can be reduced ten times yet still provide a hundred times as much CoQ10 directly to the mitochondria. Once it neutralizes a free radical MitoQ is recycled back to its active form allowing it to perform this task over and over again. MitoQ is rapidly and actively absorbed from the gut and readily passes through other biological membranes. MitoQ has shown significant promise in over 50 different models of health conditions including seven of the top ten most costly to human life., Over 180 research papers have now been published. MitoQ is better, faster and stronger than CoQ10. MitoQ is water soluble and has excellent absorption with high bioavailability. CoQ10 is not water soluble and has low bioavailability. MitoQ doesn't need to be taken with food unlike CoQ10. MitoQ very quickly reaches peak concentrations in the body, unlike CoQ10. Almost all of MitoQ is rapidly and extensively taken up into your mitochondria by an active process, unlike CoQ10 where a very small percentage actually penetrates the mitochondria. MitoQ requires very small doses due to excellent absorption and bioavailability (10mg) cf. CoQ10 requires up to 400mg. MitoQ is an effective antioxidant due to superior absorption and rapid recycling back to active form. MitoQ has widespread and efficient uptake by the body signaling significant potential in improving human health!